Elephants at PAWS are never punished or disciplined for any behavior. 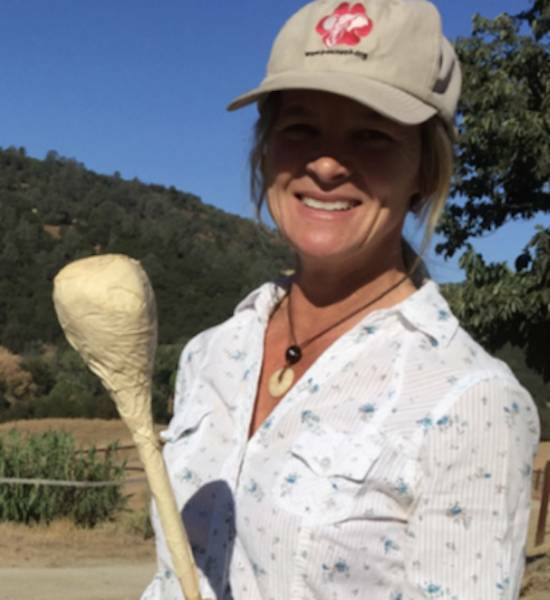 The topic of elephant handling and training has become part of the national dialog on elephant care in light of a wave of legislative action banning the use of the elephant bullhook in progressive cities across the country, and, now, in California with SB 716, the bill that would ban the bullhook statewide. One of the claims made by proponents of the circus-style training system known as “free contact,” which relies on use of the bullhook to control elephants, is that elephants in free contact receive better veterinary care than those in “protected contact” management, which is what we practice at PAWS. Nothing could be farther from the truth. I have worked with elephants in both free and protected contact, and have a broad base of experience in caring for them. So I welcome this opportunity to share with you information about PAWS’ comprehensive program of veterinary care for the elephants living at the ARK 2000 sanctuary. Each elephant barn at ARK 2000 is equipped with a barrier wall that has been designed specifically for elephant care. Strategically placed openings, like the ones in the photo above, allow veterinary and elephant care staff to work closely, and safely, with the elephants. 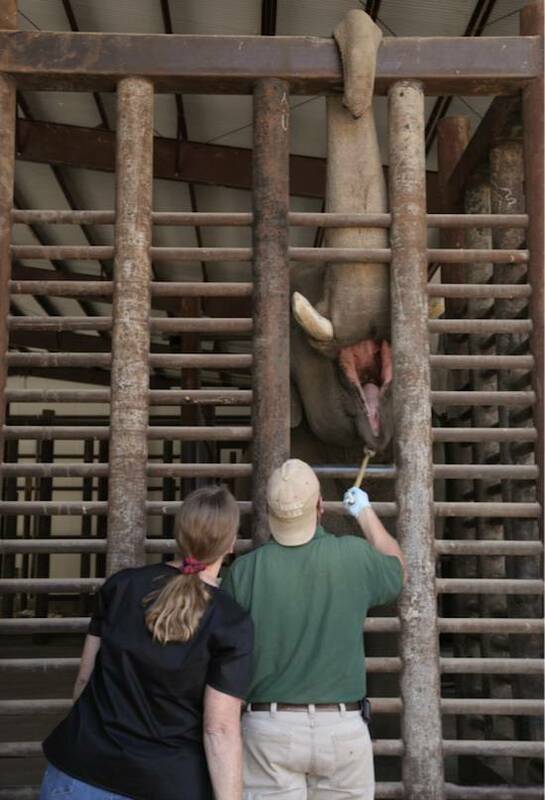 Here you see Elephant Manager Brian Busta asking Asian bull elephant Nicholas to voluntarily move toward the “target” and open his mouth and hold still, enabling PAW’s veterinarian Dr. Jackie Gai to check his teeth. Elephants grow up to six sets of teeth throughout their long lives, and it is important to make sure that they are aligned and wearing properly. 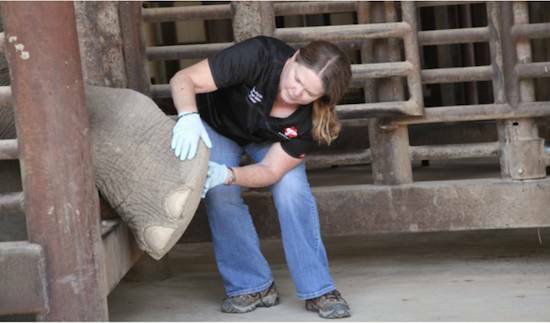 Elephant caregiver Michelle Harvey holds two of the "target" poles used in protected contact management. The poles are made of bamboo with a ball of soft paper wrapped in masking tape at the end. All of the elephants at PAWS are trained and managed in protected contact which uses only positive reinforcement training. The elephant care team and veterinary care staff interact with elephants through a barrier which protects both humans and elephants. Openings at the bottom of the protective barriers are specifically designed for elephant foot care. In this photo, Brian has asked Nicholas to voluntarily present his foot to Dr. Gai. While Dr. Gai does her examination, Brian keeps Nicholas still with rewards of praise and bits of fruit treats. Proper foot care is very important in captivity, and routine checkups help detect problems early. The elephants are trained to voluntarily cooperate with us with food treats and words of praise as their reward for moving into and holding a specific body position. Elephants at PAWS are never punished or disciplined for any behavior. Please read Dr. Gail’s complete report her (PDF).